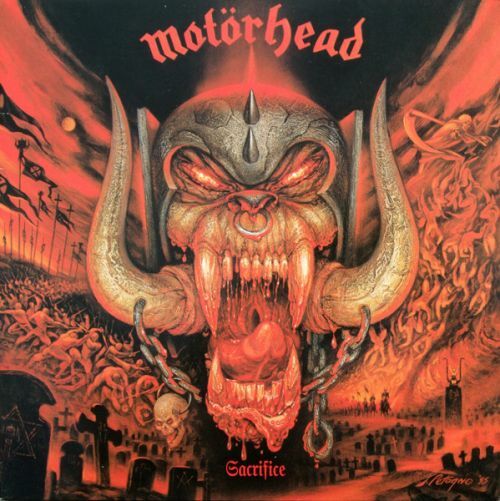 MOTORHEAD - SACRIFICE VINYL RE-ISSUE (LP BLACK) | Online Shop | Wizard LTD. Album: "SACRIFICE VINYL RE-ISSUE (LP BLACK)"
Motorhead&apos;s 1995 Sacrifice is the second, and last album, to feature the short lived four man line up of Lemmy Kilmister, Phil Campbell, Wьrzel, and Mikkey Dee, as Wurzel left the band at the end of recording this album. Howard was producing us again, but he&apos;d also just gotten an A&R gig with a label called Giant. So his mind was in at least two or three different places, and half the time the engineer, Ryan Dorn, was holding it all together, following the direction Howard gave him. And it was becoming clearer every day that Wurzel was on his way out of the band. He wouldn&apos;t extend himself at all, and usually just sat there while we were writing songs, with his guitar across his knee. When we stopped playing, he stopped playing and when we started again, he would too. Bill Bergman – saxophone on "Don&apos;t Waste Your Time"
John Paroulo – piano on "Don&apos;t Waste Your Time"